Easy Eid al Adha Cupcakes – Hello Holy Days! Short on time? 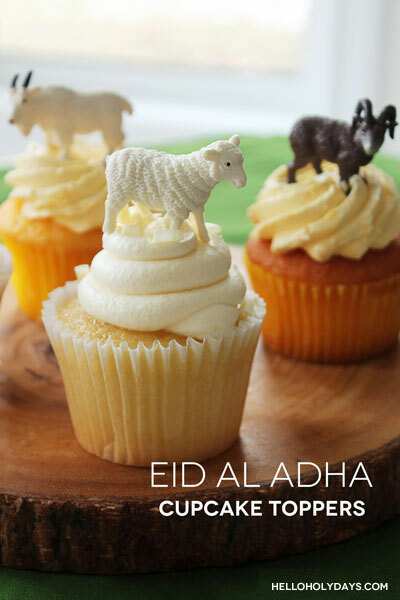 Try your hand at these easy Eid al Adha cupcakes! Order some lovely cupcakes from your favourite bakery; then top each cupcake with miniature plastic animals relevant to Eid al Adha like sheeps, goats and rams! For an added touch, display the cupcakes on a wooden platter and pair with a green tablecloth, reminiscent of grass. Before eating the cupcakes, or handing to small children, just be sure to remove the toppers from the cupcakes. I purchased this set of animals from Michael’s Arts & Crafts Store but you can also order online (affiliate link below). Adding on these plastic animals is the same as when a store or bakery adds on plastic toppers to their cakes or cupcakes. But, if you’re concerned about the plastic touching the cupcake here’s a little tip. Take a small piece of fondant and stick it onto each of the animals’ legs – then insert it into the cupcake. That way the plastic doesn’t touch the cupcake, only the fondant does! You can also use something like Airhead’s candy because it’s easy to mould, just like fondant. 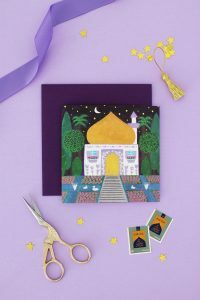 For more ideas on how to use miniature plastic animals for Eid al Adha, check out my previous post. If reposting our picture, please give photo credit to Manal Aman and link back to Hello Holy Days!